A couple weeks ago I couldn't find my 'regular' hummus recipe so I went looking for one online. That's when I found this recipe that promised the secret to smooth, better-than-storebought hummus. So I tried it. And now this is my regular hummus recipe. In the bowl of a food processor, combine tahini and lemon juice. Process for 1 minute. Scrape sides and bottom of bowl then turn on and process for 30 seconds. This extra time helps “whip” or “cream” the tahini, making smooth and creamy hummus possible. Add the olive oil, minced garlic, cumin and the salt to whipped tahini and lemon juice. Process for 30 seconds, scrape sides and bottom of bowl then process another 30 seconds. Open can of chickpeas, drain liquid and rinse. Add half of the chickpeas to the food processor and process for 1 minute. Scrape sides and bottom of bowl, add remaining chickpeas and process for 1 to 2 minutes or until thick and quite smooth. Most likely the hummus will be too thick or still have tiny bits of chickpea. To fix this, with the food processor turned on, slowly add 2 to 3 tablespoons of water until the consistency is perfect. 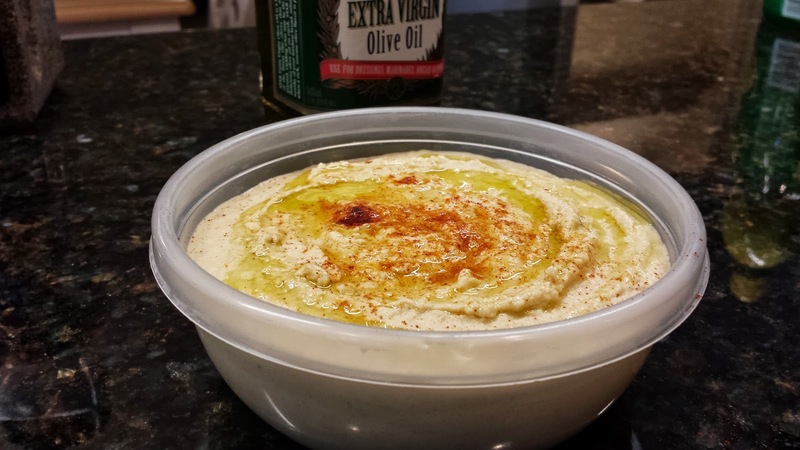 Scrape the hummus into a bowl then drizzle about 1 tablespoon of olive oil over the top and sprinkle with paprika. Store in an airtight container and refrigerate up to one week. Yum! This is so good with veggies and pita chips. Does this method really make a difference? I'm not completely sure, but I had at least one comment about how smooth it was, so I'm going with it. The flavors are also perfect. I didn't have any fresh lemons, so I used the lemon juice out of a bottle, and it turned out fine. I also used home-cooked chickpeas and saved some of the cooking water to add at the end. I'm making this again as soon as I buy more celery. Hummus and celery is one of my favorite things. And those sea salt pita chips from Aldi. Have you tried those? The best pita chips ever. To go with this - the best hummus ever.